Telling stories that engage the ear, challenge the mind and delight the soul. 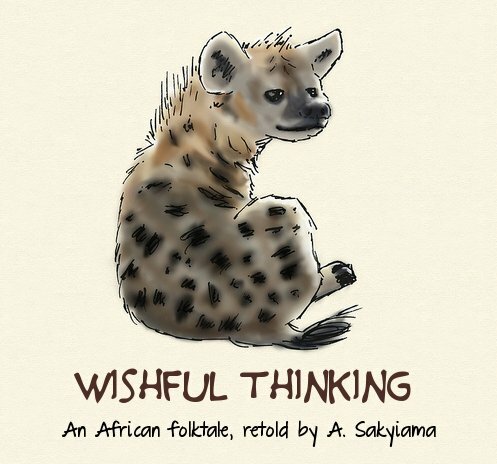 It’s story time and I have another hyena tale to share. Poor hyena, an ugly coat was only the beginning of its troubles. Credits: Hyena illustration by Jason Sweeney, via flickr. Once upon a time, a hyena and a leopard met and became good friends. They sometimes hunted together and shared the food equally between them. One day, the leopard was out alone, hunting for food, when the enticing smell of fresh fish came into its nostrils. The hungry beast followed the smell and found that it was coming of off a cart being pulled by a tough looking man. It was a fisherman hauling home a good day’s catch. Hunger made the leopard’s brain sharp. In a few minutes it had worked out a plan. Staying hidden from the man’s view, it ran ahead and then laid down in the middle of the road. He picked up the leopard and tossed it into his cart. In the cart, the leopard lay still and quiet until it was sure that the man’s attention was elsewhere. Then, as fast as it could, it threw out enough fish to make several fine meals and jumped off the cart. The leopard was very disappointed to see that most of the fish it had thrown out of the cart had already been eaten. It was not the only beast who had smelled the fish and followed its nose. Its neighbour, the hyena, had done the same. It had followed the cart and gobbled up most of the fish that the leopard had risked its life to steal. The leopard told the hyena to lie in the middle of the road and play dead. The hyena immediately ran and lay in the path of the cart. The leopard went home in a better mood because it had a very good idea of how things would turn out. He poked it with his stick and then started hitting it quite hard. Through it all, the hyena lay still as if dead. It held it’s breathe when the man picked it up. Instead of throwing the hyena into the cart though, the fisherman threw it into the bushes by the side of the road. Poor hyena. It hobbled off in great pain. When it saw the leopard again, it told him about how badly things had gone. The leopard pretended to sympathize.